Rise is the conclusion of the Eve trilogy. I haven’t made it a secret that me and the Eve trilogy aren’t the best of friends, and Rise made that clear yet again. 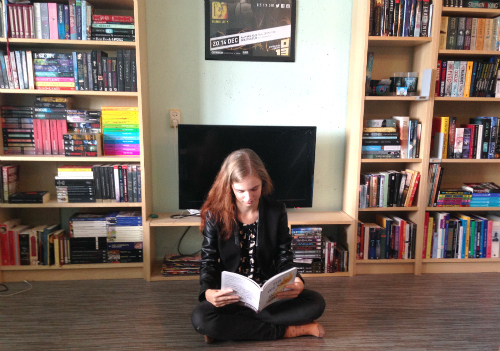 Eve is stuck in the City of Sands, where she is forced to play the loving princess. Here she is to fulfil her final mission: kill her own father, the king. 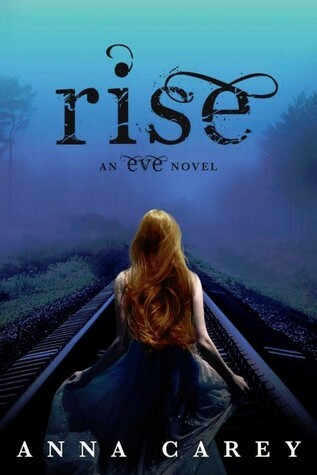 In some aspects I enjoyed Rise a lot more than Once, the second book in the series. I’ve complained about the man-hating nature of the books before, but that was almost entirely absent in Rise. There now are multiple interesting male characters that aren’t either good or horribly bad, finally. I especially liked Eve’s fiancé in the City of Sands. At least he had some shades of grey and conflict going on, and I found his personality a lot more interesting than I found Caleb’s, who was always bland for me. Sadly Eve doesn’t like her fiancé as much as I liked him. Eve. Oh, Eve. After three books I still have no idea who she is. She makes some very weird decisions in Rise that didn’t make sense to me at all. There is a lack of emotional connection with her, which is even worse when realising this is written in first person. We are shown some kind of internal rational process to explain her actions, but for me those thoughts didn’t have a real connection with her actions. It felt a bit like she was thinking “gee, those bananas are yellow” and then proceeded to go to the cinema. The missing emotional connection becomes very explicit when people start dying. Some secondary characters drop like flies, but Eve doesn’t even bat an eye. Seriously, that girl must be made of stone or something. She feels no guilt, no connection, maybe a tad of sadness, but that’s it. That’s not how someone should feel after someone they regard as a friend dies. Ms Carey made some very weird choices when writing this book plot-wise. As you can deduct from the title, in Rise we have have a revolution to overthrow the King’s regime. But the moment the revolution sub-plot starts to kick off, Eve isn’t even in the City. She barely hears any news of the city for a hundred pages. Huh? I thought that something that warrants the title of a book should get some more page-time and be more important. Overall this book wasn’t all that terrible. At least not as terrible as I was dreading it to be, and I was willing to give it three stars. But then I saw how this trilogy was wrapped up, and I knocked off that hard-earned star again. You can picture it as a mix between the cheesiest and most obnoxious Disney ending you can imagine, and then make sure that all the other plot lines don’t get wrapped up at all. That’s how Rise ends. Proceed with caution.